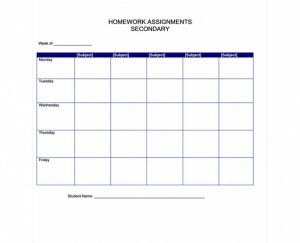 Keep homework assignments clearly visible and organized with the homework checklist template. By using the homework checklist template, students and parents will both be able to see which assignments, reports and projects are due on which dates so that all work is completed and turned in on time. Download the homework checklist template for free directly from this page and get the school year started off right! The template is completely free which makes it an affordable option for families with multiple students. It can be printed from any home, school or work computer, making it fast, convenient and immediately ready for use. It is available from this page and can be downloaded anytime and on any schedule. It is customizable, allowing for weekly date and student name personalization. It has been specially designed for use by students in secondary schools. The homework checklist is easy-to-read and organized by day of the week so assignment due dates can always be clearly marked. Multiple homework checklist templates may be printed to be used for more than one subject or for the start of each new week so that school responsibilities are clearly defined. It allows both students and parents to see which assignments are due on which dates so that they can be completed well in advance. Download the template for free from this page then save it to the computer. Customize the homework checklist by adding the “week of” dates and the student’s name. Print the checklist. Consider using brightly colored paper in order to make the checklist stand out in a folder, notebook or on the fridge. Place the checklist either someplace noticeable in the home or schoolwork environment or in the front of school folders. The checklist can also be placed in the front of each subject tab if a separate calendar is being used for each topic. Mark assignment, project, report and test due dates clearly on the checklist to ensure that all deadlines are met on time. Cross off each completed assignment when they have been accomplished.